This was the recommencement of the ANZAC day commemorations for many years. Ngati Wehiwehi has taken the initiative to resatrt this significant event for Manakau. At a meeting held at the Manakau Primary School on the 10 February 1921 a decision was made to erect a granite obelisk mounted on a concrete base. On the 28 February 1921 the Otaki Mail reported that the cenotaph was being erected. The design took the form of a sarcophagus, a collective tombstone for the local boys who would never return to Manakau. Excerpts from the book Otaki RSA written by Rex Kerr. The second Anzac commemoration held in Manakau supported by the Otaki RSA and members of the armed forces from Trentham Camp. Kaumatua Bobbie Miratana and Hoko Gardiner both gave an oral history about ANZAC to the service. The whanau need some social time out. Richard, Hariata and Len hosted our whanau for a relaxed afternoon and evening of social chit chat. 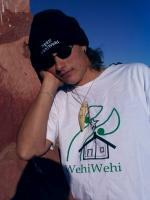 Wehiwehi have the following merchandise still for sale. The T-shirts are $20.00, the singlets are $15.00 and the number plates are $20.00. Contact the Chairman if you would like to order any product.